with qualifying tablets, a new report claims. According to a story by The Verge, Windows CFO and CMO Tami Reller announced at Computex that Microsoft plans to ship Office Home and Student 2013, which includes Excel, PowerPoint and OneNote, with "small screen" tablets running the full-flavoured version of Windows 8. Engadget, which tracked down a Microsoft representative at Computex, has reported that the software giant defines "small" tablets as those with a screen size of 10-inches or under, which rules out the company's own 10.6-inch Surface Pro device. 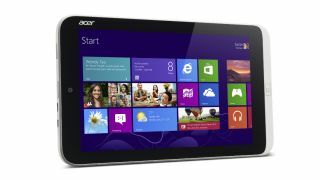 It does, however, include Acer's Iconia W3, which was unveiled at Computex and will be the first tablet to ship with the free offering. It's up to other OEM manufacturers to bundle the Office suite with their tablets, so it's not yet clear which other device makers are onboard. While Microsoft has decided not to include Outlook in the bundle, Reller has also announced that Outlook RT will be making its way to tablets with ARM processors runing Windows RT as part of its forthcoming free Windows 8.1 upgrade. It will be joining existing Office RT applications including Word, Excel, PowerPoint and OneNote.